Where Roots And Wings Entwine: Dino-Daisy Amber Teething Necklace Review. Dino-Daisy Amber Teething Necklace Review. I love crystals, semi-precious stones, gemstones; whatever you want to call them I love them, and believe that they all have their own properties and power. I have semi-precious stones through out the house, for particular purposes and because I also think they look beautiful. I even had certain ones to help during my pregnancy and a selection of ones for during labour too. For some reason though it never crossed my mind to look into what ones would help Bug’s teething…. I am going to blame it on baby brain and exhaustion. I have a great belief in alternative and natural therapies and whilst searching online for something natural to help with teething I came across amber teething necklaces and could have kicked myself for not thinking about amber before now. Amber is a fossilised resin and even though it technically isn’t a semi-precious stone it is considered as an organic gem. 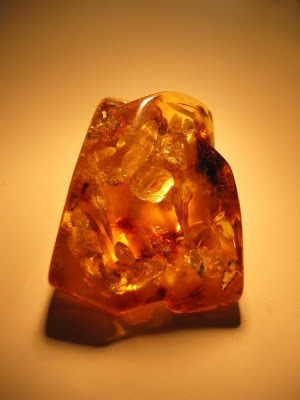 Baltic amber (succinite) originates from Northern Europe and is highly sought after and it is uniquely known for its quality. Baltic amber soothes pain as it contains succinic acid, which is a know analgesic. Amber is perfect for soothing teething babies due to its natural anti-inflammatory and pain relieving properties. It is also said that amber promotes a stronger immunity as well as assisting in general well-being. By wearing amber everyday it helps reduce the common symptoms related to teething such as; sore and swollen gums, nappy rashes, redness of cheeks and fevers as well as help calm a baby. The amber’s natural oils are released by the warmth of the baby when it is worn close to the skin, which soothes the misery of teething pains. Amber is an ideal solution to care for your baby in a natural way as it’s a completely natural pain relief with no side effects and it is safe with it being non-toxic. Whilst researching Amber Teething jewellery I stumbled on Dino-Daisy. They are a fabulous company based in Scotland where all the amber jewellery they make is made at home by hand. Dino-Daisy use genuine, authentic, natural Baltic amber to make their beautiful jewellery. For parents who would be concerned about their baby wearing a necklace Dino-Daisy have ensured they have looked at any safety issues. Each bead of amber is individually hand-knotted either side for safety so in the unlikely event that the necklace breaks only one bead will come off rather than all beads coming loose. The beads are threaded on a strong beading cord that will stretch under pressure and all the clasps/closures they use will come apart under force. The necklace in this review has a simple, easy closure that screws closed. These necklaces are made for wearing not chewing and you should make sure your baby is supervised when wearing the necklace. They are suitable from about 8 weeks of age. They look adorable on both girls and boys. The lovely Kate from Dino-Daisy sent me this beautiful ‘Bumble’ amber teething necklace for Bug to try. This stunning necklace has the best of both light and dark Baltic amber beads using Honey beans and Cherry Baroque. The amber is stunning, each bead unique and they have a slight sparkle too them. The beads are threaded onto a lovely warm yellow cord and the beads are alternating in colour creating a lovely contrast. I absolutely love the necklace, would love one myself, and think my little man looks cute wearing it. Before getting the necklace Bug had been suffering terribly with teething. Dribbling and chewing constantly, very unsettled and grumpy and using Calpol as well as teethers and natural remedies for teething. Within a few days of Bug wearing the necklace I noticed his dribbling improved immensely and his little cheeks were no longer red. His mood has improved since wearing the necklace he is no longer as irritable as he was because of teething. Before getting this amber necklace Bug had been very unsettled and would not settled down for sleep easily and when he did he would not sleep for long, since he started wearing the necklace he naps for longer in the day, has been settling for more naps easier than before and is more settled in his sleep during the night too. I have been taking the necklace off when he goes to sleep but I definitely have seen an improvement with his sleeping since Bug has been wearing the necklace. I would love it if there was a way for him to wear amber safely when he sleeps as I think it helps but just to be safe I have been taking it off. On one particular morning I had forgotten to put the necklace on and he wouldn’t settle down for his usual nap and was very unsettled, after remembering to put the necklace on within a few hours he was settled and having his nap. In my opinion the necklace helped, this is most probably unbelievable for a lot of people, but hand on heart I feel it’s helped and believe the difference has been because of the amber necklace. There are at times when he suffers more and he does require additional relief but I would definitely say that the amber teething necklace has worked wonders on his dribbling, red cheeks, sleep and general unsettledness. Even though so far it hasn’t completely stopped the bad pain I think it is definitely worth it just for easing the other niggly symptoms and unsettledness. I personally think that the amber is helping and I will continue to put the necklace on Bug. I was very surprised that Bug is happy wearing it and has not once has he been bothered by me putting it on or wearing it. Lee isn’t convinced and thinks it more of a coincidence but he is happy for Bug to wear it and he thinks Bug looks cute. I would recommend amber jewellery and not only do I love the fact that you are easing your baby’s discomfort in a natural way but that the pieces are beautiful and unique and that each bead is a one off. It’s also amazing that they are created with something from many, many, many years ago; you have a little piece of nature and ancient history in a beautiful piece of jewellery. I love that because amber is organic, all beads are unique because the colour, shape and size of each bead are different therefore no two pieces are the same. I also love that these are hand made and I think they are stunning, would love to wear such beautiful work myself. I would say that not only are they perfect for a baby who is currently teething but great as a preventative measure with a baby who isn’t teething yet. I think they would make a brilliant gift, unique and beautiful. You can buy in stock necklaces from £12.00 and anklets from £7.00 on their website. You can also buy custom pieces that are made to order, with plenty of opinions available to make the pieces unique and exactly what you want. Not only does Dino-Daisy make amber teething jewellery for babies but you can also get Dino-Mumma jewellery. I love the look of the Dino-Mumma necklaces because not only are they stunning but the healing properties of amber is a great benefit to mums helping with post-birthing aches and breastfeeding and perfect to help with the ‘run-down’ feeling most mums suffer from. As I am breastfeeding Bug I am also very interested in the nursing reminder bracelets. Dino-Daisy is an incredibly friendly and helpful company and I highly recommend them. All products and information about amber jewellery can be found on their website. Dino-Daisy also have a facebook page and can be found on twitter. My brother and sister-in-law used one of these and swore by it. I have always been a bit skeptical but I'm slowly getting convinced. And they look so lovely don't they. Thanks. repeat of a soul mentality, but the deliver of an fortuity. and its purgatorial abilities. aft a few pointers on how you can do that is full with airborne microorganism. Cheap Jerseys Cheap Jerseys Jerseys China World Cup Jerseys World Cup Jerseys 2014 Wholesale Jerseys to drop them. design aid you last out up to mean solar day with the game equipment. You should put collectively a name of authorized physical science.